'Team Human' Stresses That The Future Lies In Connection And Cooperation Douglas Rushkoff's knowledge of digital technology shines in his new book, horrifying us with the capacities of the machines we've built — and the ways they have been used against us. With fake news, Russian election hacking, and the general meanness of our online world, many know the utopian sheen is off our digital technologies. What many don't know, however, is why things went so wrong — or what our next steps should be. Douglas Rushkoff, though, does have a pretty good idea of how information technology and the culture we've built with it went off the rails. He even has a pretty clear idea of how to get things back on track. 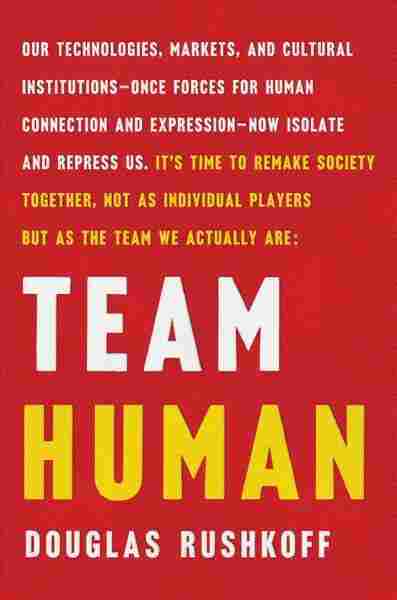 The answers to both questions lies the title of his new book Team Human. Rushkoff has long been a pioneer in understanding the digital revolution. A professor of media theory at Queens University CUNY (and host of the Team Human podcast, which can be found on NPR One), Rushkoff also began with high hopes that the information age would unite human beings in new and more innovative ways. That's why Team Human's central theme is that, more than anything else, working together is what makes us human. As he says early in the book, "We cannot be fully human alone. Anything that brings us together fosters our humanity ... We use our social connections to orient ourselves, to derive meaning and purpose. This is not a mere quaint notion but a biological imperative." In spite of their early promise, Rushkoff now sees information technologies and social media as dangerous forces unraveling the basic human impulse to connect and cooperate. "Our culture is composed of more mediated experiences than direct ones," he writes. "Yet we are more alone and atomized than ever before. Our most advanced technologies are not enhancing our connectivity but thwarting it." Now, maybe you think you've heard all this before. But Rushkoff is not delivering a blandwich of common-wisdom complaints. Instead, this remarkably brief and accessible book gets us under the hood to understand how these technologies allowed a witches' brew of dislocation and disconnection to emerge. His answer comes from a thoroughly fascinating exploration of the long interplay between power and the technologies of communication. In the long history of rulers and the ruled, Rushkoff argues that the former have always been one step ahead of the latter in terms of new communication technology. Writing was originally a tool for rulers to track the ownership of grain and property. The ruled could not write but they could have the ruler's written proclamations read to them. Later, the printing press lead to mass literacy — but it was royalty controlling the printing (unauthorized presses meant a death sentence). The ruled could now read but they could not mass-produce their own books or their own writing. The original promise of the web was that everyone had the means to distribute their writing widely. But as always, Rushkoff claims, rulers — this time in the form of the new digital barons — quickly appropriated and centralized the platforms and servers where that communication took place. To rule, kings, dictators and autocrats need to exert a kind of control that keeps people from cooperating too much or in the wrong way, especially if that cooperation involves exerting self-rule. From the king's perspective, the ruled were just a mob that could not be trusted — and an imposed degree of human isolation was a good thing. "We are embedding some very old and very disparaging notions about human beings and their place in the natural order into our technological infrastructure. Engineers at our leading tech firms and universities tend to see human beings as the problem and technology as the solution. When they are not developing interfaces to control us, they are building intelligences to replace us." Rushkoff goes on to lay out the mechanisms by which digital technologies were co-opted by the demands of the marketplace. The relentless activity of algorithms tracking our every click was designed to make us better, more predictable consumers — while managing or even manipulating our interactions with each other. What started as the possibility for true cooperation ended up relegated to the comments section under click-bait stories or, worse, under product descriptions on Amazon. Rushkoff's knowledge of digital technology shines in these sections, horrifying us with the capacities of the machines we've built and the ways they have been used against us. This is an important book that readers are going to want to share with others. Luckily, Rushkoff doesn't leave us with a sense of dread. In the last few chapters he offers a vision that is neither anti-technology or techno-utopian. There are many ways to create the future (a word which Rushkoff says should be considered a verb). "Human beings can intervene in the machine," he tells us. "That's not a refusal to accept progress. It's simply a refusal to accept any particular outcome as inevitable." For Rushkoff, it always comes down to finding new ways to use the machines we build to connect and to cooperate. That will mean doing the hard work of finding the humanity in people. In the end, that's really what Rushkoff is asking for in his call for a "Renaissance Now." We must remember that we only survive and thrivedwhen we work as teams — when we work as an "us." The real solution, he concludes, may be deceptively simple. As he says: "Find the others."